Gloam Valley is the setting of Chapter 2 in Super Paper Mario. The valley itself only appears in the first section of the chapter. (Chapter 2-1: Bogging to Merlee's) A swampy area with many enemies and underground caverns. Boomer the Pixl is found here. (Chapter 2-2: Tricks, Treats, Traps) A large building that is home to Merlee and the Gnips. It has been taken over by Mimi and filled with several traps. (Chapter 2-3: Breaking the Bank) An area of the mansion devoted to Mimi's slave trap. Mario and Princess Peach briefly become enslaved. Slim is found here. (Chapter 2-4: The Basement Face-Off) A maze-like area filled with enemies. Mimi pursues the heroes throughout the area and is fought as the Chapter Boss. With Princess Peach at his side, Mario set out once again, bound for adventure. This time, our heroes were tasked with finding the mysterious charmer, Merlee. If Merlon was right, then Merlee was the key to finding the next Pure Heart. Never one to flinch from danger, Mario set out to find Merlee's mysterious mansion. Gloam Valley becomes accessible after finding the orange Heart Pillar in the Flipside Outskirts. It starts with a span of land and a platform above with three red Koopa Troopas on it, as well as a ? Block containing a Coin. Beyond that is a higher platform and a pool of water with a high wall to the right of it. Peach must use the platform to float over the wall. Beyond the wall is another, larger pool of water with some Cheep Cheeps and floating platforms. There is a small stretch of land with a Squig on it, then another large pool of water with several platforms above it. At the end of the pool is a locked door. Fliping reveals an arrow pointing back across the water. On the small piece of land, there are some yellow blocks in 3D that flip to 2D when hit and can be used to get up to the platforms. Traversing these leads to a pipe above the door. The pipe leads to an underground room with two Squiglets and a Squig. Defeating these reveals a Door Key. The next area has a block containing Pal Pills at the start, then some Paragoombas. After them, there is a door leading to a small area with a man named Lock. Lock won't talk to Mario, but he finds Peach cute. When she tells him she is headed to Merlee's Mansion, he panics and warns her about bad things happening there. Interacting with Lock is completely optional. Beyond that door is some more Paragoombas and a pipe with a Piranha Plant in it. The pipe can be stood on to get to a platform, where some rectangles will flip the player up to another platform. 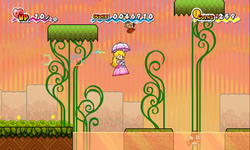 Peach's parasol can be used to traverse some more platforms and get to a pipe leading to the background, where there is a switch that creates a door. In the next area, there are several blocks, one containing a Mega Star. This can be used to get through this entire area, which consists of blocks and enemies. At the end, there is a Save Block and a door. The next area has some water and some platforms above. There is a Slow Flower in a ? Block. After that, there is a stretch of land with some enemies. At the end, there is a platform with five other platforms above, but they cannot be reached because this platform is covered in blocks. The player must go down a pipe to an underground area that is seemingly empty, but Tippi reveals an invisible switch block that activates a pipe. Down the pipe is a Growmeba that, once defeated, reveals a large chest containing the Pixl Boomer. After he is recruited, he can used to clear the blocky platform. Above, there are five platforms, four with doors on them. The first door leads to the bottom of a cave. An upper level with a switch can be seen, but not accessed from here. The second door leads to the bottom of a different cave with a Shlurp. The third door leads to the same cave as the last, but at the top. Flipping reveals that part of the floor has a hole patched up with blocks that can be destroyed with Boomer. The floor below that has many coins and another leading down to where the second door leads. The last door leads to the top of the first cave. The player can descend in the same way as the last door, but instead of coins, there is a switch that causes a loud rumbling. Leaving the cave reveals that a door has appeared on the fifth platform. The last area has two Cherbils and the Star Block. Merlee's Mansion can be seen in the distance. Flipping reveals a hole that leads to a small area with two Swoopers, two chests and a trampoline to get back up. The chests contain a Shlurp Catch Card and a Swooper Catch Card. Hitting the Star Block completes the level. "Tall marsh grasses carpet this rich and wild wetland. You first met Boomer here under the ground." Towairando Twiland, a portmanteau of "twilight" and "land". The background music for Gloam Valley is the same music that was featured in the Super Paper Mario trailer.